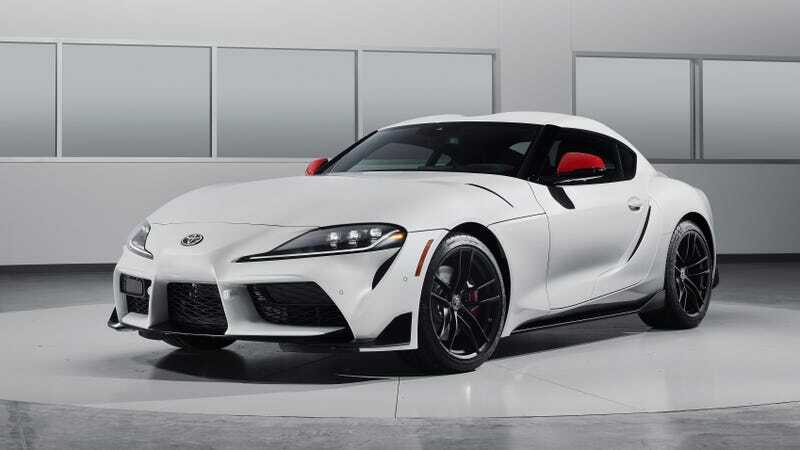 The Toyota Supra is back for a fifth generation with BMW parts, no manual transmission and a starting MSRP of about $50,000. Because anyone putting that much cash into a car with two seats is definitely concerned with daily fuel expenses, we are happy to report it is rated at 26 mpg combined on premium fuel. The EPA published numbers for the Supra coming to 24 mpg in the city, 31 mpg on the highway and 26 combined. The EPA also estimates it’ll cost an average of $3.16 in premium gas for each 25 miles that a Supra owner drives their car, but that kind of prediction involves a lot of averages and estimates. One can easily assume all Supra owners will be doing a rolling burnout from driveway to destination and racking up more significant costs. The Supra’s fuel economy is nothing to be impressed with in 2019—expected, given that it’s an inline-six sports car with no hybrid assist—but it’s expectedly a few steps above the outgoing generation of the car. The EPA has fuel-economy numbers for cars dating back to 1984 online, and the most recent Supra on sale in the U.S., the 1998 model, got just 18 mpg combined with the twin-turbo 2JZ. So, while our 2020 Supra won’t get fun things like a clutch pedal—at least, for the time being—it has some perks. Its fuel economy isn’t the worst, for one, and its perceived market value doesn’t skyrocket each time a photo of it pops up on Bring a Trailer. It’s a real money saver, when you think about it that way.